After doing some digging I found that the account I was using had been inadvertently been removed from the “RTCUniversalServerAdmins” group. Once I added the account back and logged out and back in I could now run the commands. Interestingly enough, if I checked the RBAC roles this command has been assigned to I see “CSAdministrator” and “CSServerAdministrator”, but having those permissions didn’t allow me to run it. When I checked the technet information for the cmdlets I see RTCUniversalAdmins was required for the Get-CsBackupServiceStatus but not the Invoke-CsBackupServiceSync cmdlet (they both actually need it). I have emailed the Lync Documentation team for more information and will post back here with any updates. 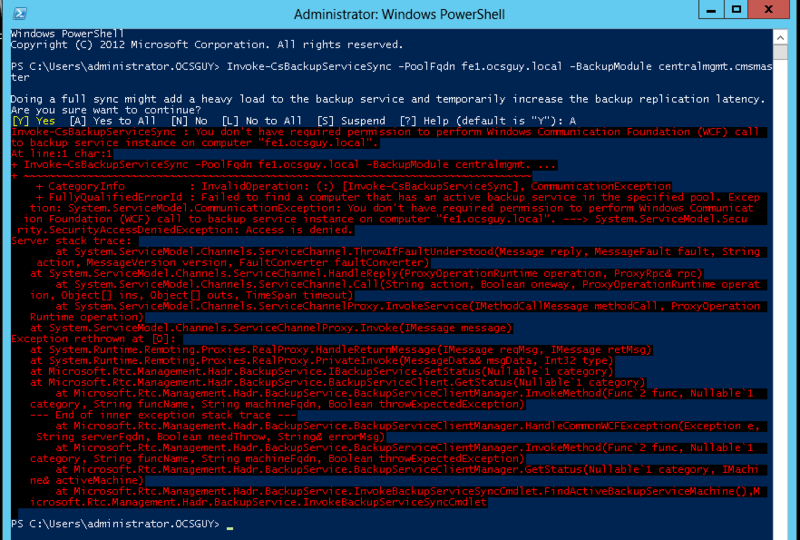 This entry was posted in Uncategorized and tagged Get-CsBackupServiceStatus, Invoke-CsBackupServiceSync, Lync 2013, Lync 2013 Backup Service, Lync 2013 Replication, Lync 2013 WCF, Lync Management Shell, Lync Server 2013, You don't have required permission to perform Windows Communication Foundation (WCF) call to backup service instance on computer. Bookmark the permalink. This sounds like the issue many others have seen with the CS* RBAC groups versus the RTC* groups. In my understanding, the CS* RBAC groups only grant permissions to run Lync cmdlets remotely (i.e., via Powershell remoting), whereas only the RTC* groups grant permission to run cmdlets locally on Lync servers. Seems this is the behaviour both in Lync Server 2010 and 2013.